A reminder that the District Council election is about more than just local politics. Today’s SCMP has run this news-free story boosting Amy Yung’s opponent in Discovery Bay. Amy is your quintessential conscientious elected representative. She has a 100% attendance record this year in both council and committee meetings. For most of the past four years she has been the only voice of democracy and conservation in the Islands District Council. Only since the election of Peter Yu, another Civic Party representative, 18 months ago has she had someone to second her motions. The Post solemnly reports that her opponent offers a “moderate win-win approach” in contrast to her allegedly confrontational style. For anyone who has ever met Amy, that is laughable. She has the kind of low-key demeanour that you’d expect from a certified accountant. As for “moderate win-win” – the candidate’s one specific “solution” is that residents pay higher charges. The story doesn’t mention the high level of support for Yung in challenging DB manager HKRI, or the dissatisfaction felt by residents over its high-handed behaviour: i.e., the introduction of taxis, the attempts to double the resort population and expand the golf course, and its lack of transparency. If the self-described moderate had anything to say about these, the Post didn’t bother asking him. But it did quote his outrageous sledge of Amy for meeting constituents in cafes. The Post at least reported Amy’s response that the HKRI can’t find an office space for her. 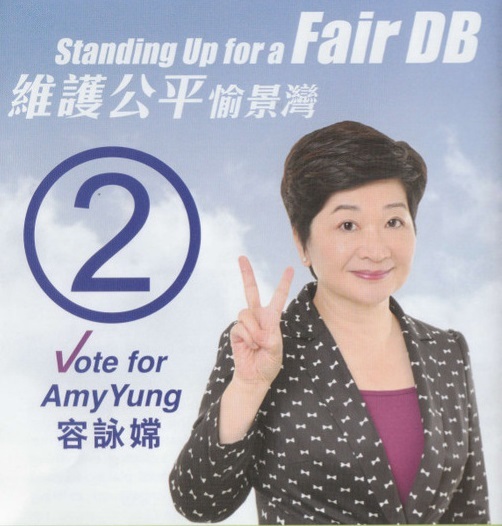 Amy’s real offence is that she has been the prime opposition to the grandiose pork barrelling that takes place in Lantau in the name of development. She was the only councillor to vote against the Shek Kwu Chau project and the only one to speak against the political reform package and in favour of Occupy. If the SCMP were genuinely looking for an Islands election story, they’d be better off covering the Lantau electorate. The opposition to the controversial development plans, the divisions in the pro-development camp and Randy Yu’s connections make it genuinely newsworthy. But the pro-Beijing camp have made it a priority to target pan-Democrat figures. This shabby story is the Post’s contribution to the effort.